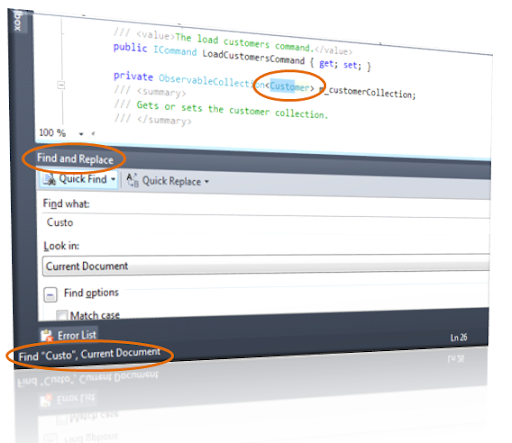 You all know that Visual Studio 2010 is now available in its RTM version. There are lots of features available in Visual Studio 2010. In this tip, I will talk about the incremental search functionality available inside it, which is very useful in day to day life of coding. So, what is the incremental search? 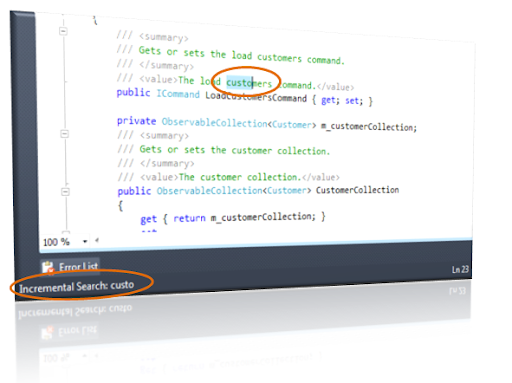 Incremental search is a mechanism in Visual Studio 2010 by which you can search and focus on the searched keyword without any UI blocking from the user end. You don’t have to open the find dialog while searching for a specific keyword in your editor window. Interested to know how it works? Let us open our Visual Studio 2010 IDE and open a sample application. Lets say in your application you have several "Customer" words and you want to find those. Press Ctrl + I again to go to the next result. If you press Ctrl + Shift +I, this will search in the backward direction. In this entire search you will notice that, it doesn't open up any extra UI in the screen, thus not blocking the editor window, which is really helpful while searching for some specific word. 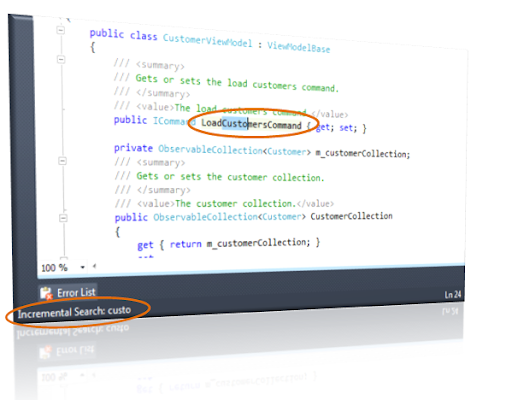 If you have come this far, it means that you liked what you are reading (Tips & Tricks: Incremental Search in Visual Studio 2010).